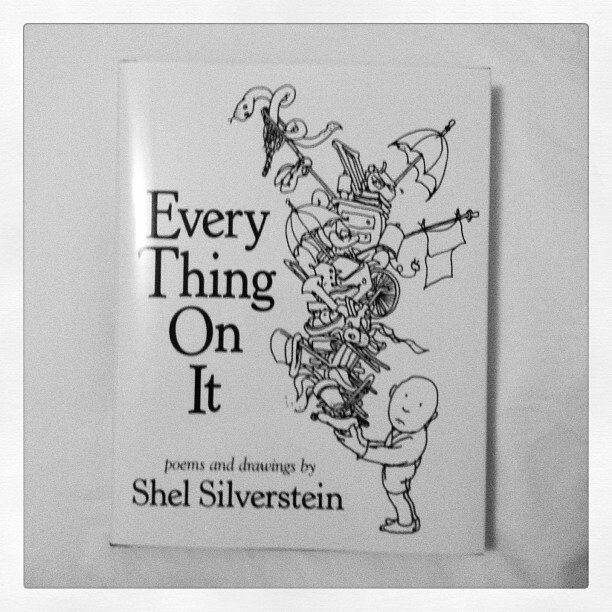 I don't know about you, but I was a huge Shel Silverstein fan growing up. The Giving Tree will remain one of my all-time favorite books. I remember sitting in bed amongst overstuffed pillows and animals with my copy of Where The Sidewalk Ends, reading aloud, and his clever poems bringing my imagination to life. Thus, I was ecstatic to stumble upon his new book last night! I immediately scooped it up and ran to the nearest register like a little kid who just discovered her beloved toy wasn't actually discontinued. Q: Shel passed away in 1999 but more than ten years later you’re publishing Every Thing On It, which includes tons of his never-before-seen poems and drawings. Can you tell us how this project came to be? Markiet: Over the years, Shel continued to write and draw and work on poems. He left a rich archive of finished material. In the past few years, the Silverstein family has allowed us to unveil some of these in special editions of both Where the Sidewalk Ends and A Light in the Attic. The response was so amazing that the family felt it was now the right time to publish this book. Boy was I in for a treat. I climbed in bed late last night and read out loud with a big ol' goofy grin on my face! For years and years and years . . ."
I hear you laughing--and I smile."